Hello! 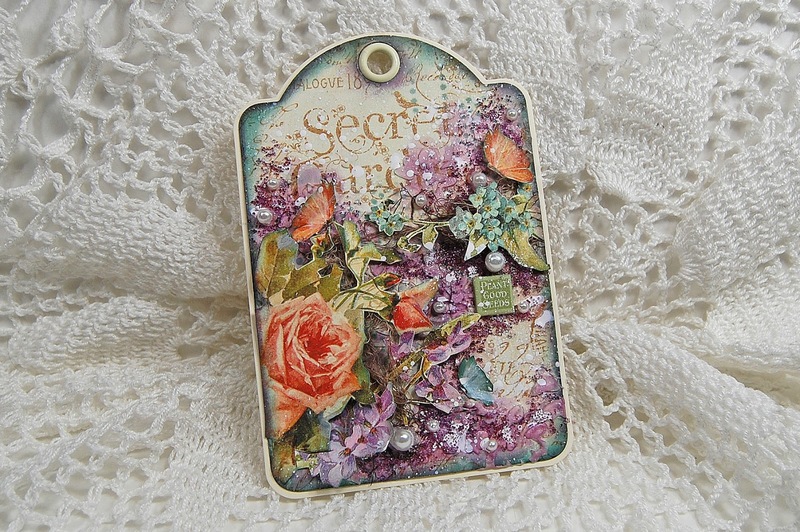 I have a tag to share with you that I created with the beautiful Secret Garden collection by Graphic 45. 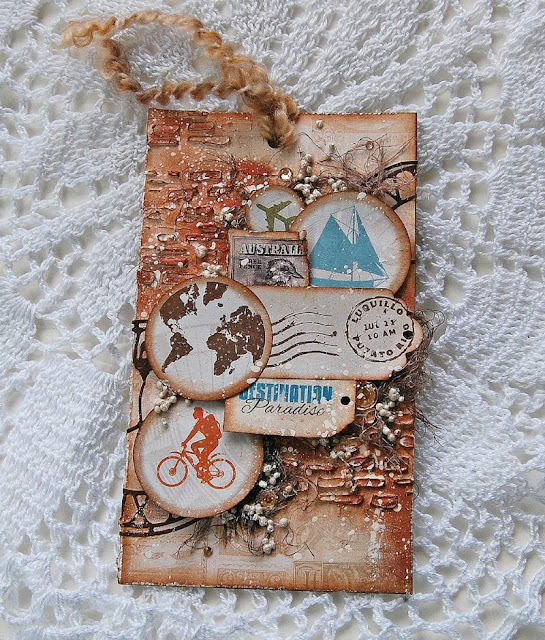 I started cutting a tag from one of the papers using the tag die from Graphic 45. I adhered it to one of the ivory tag from the tag albums after I distressed ink all the borders with ink.. Then I added color with a sponge to the background using the Color Box-Graphic 45 inks with a stencil. I cut out some flowers and butterflies from the Secret Garden collection papers and adhered them with 3D foam tape to add dimension. I also adhered some chipboards from the same collection. Once I adhered the different images I gave textures around them with a stencil with modeling paste. 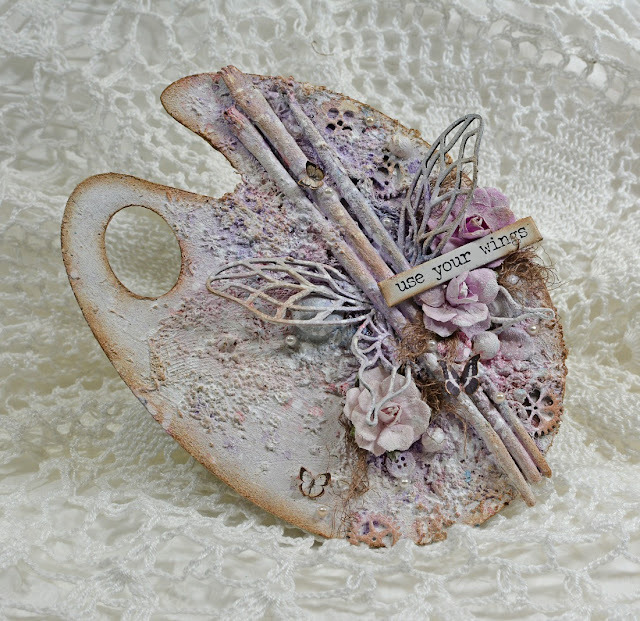 Next I painted the textures with the French Lilac ink that I mixed with water and applied with a brush. Finally I adhered micro-beads, pearls with gel medium, then added some white paint splatters and it's the final result... I hope you find some inspiration...Thank you so much for stopping by, until next time!!! Hello my scrappers friends!! I have an art palette chipboard that I altered using the fantastic Creative Embellishments products. 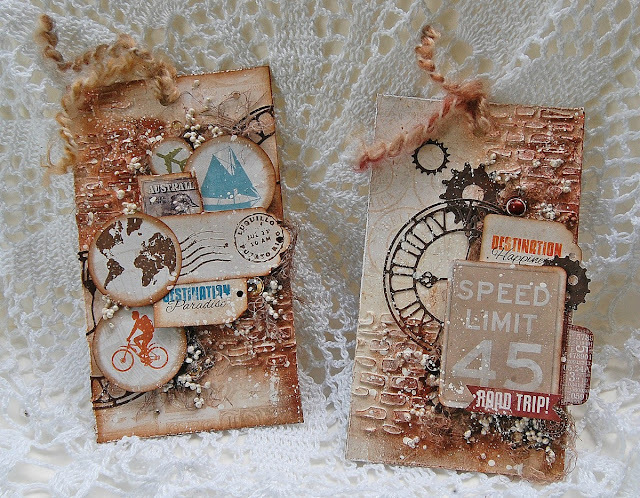 I started my project applying a coat of white gesso to the Art Palette chipboard. 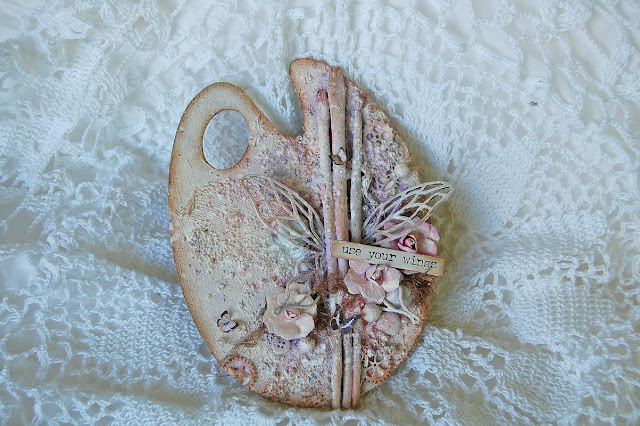 Once it’s dry, I gave textures with the Fairy Dust stencil and modeling paste. You can watch all the creative process in the video tutorial at the end of this post. 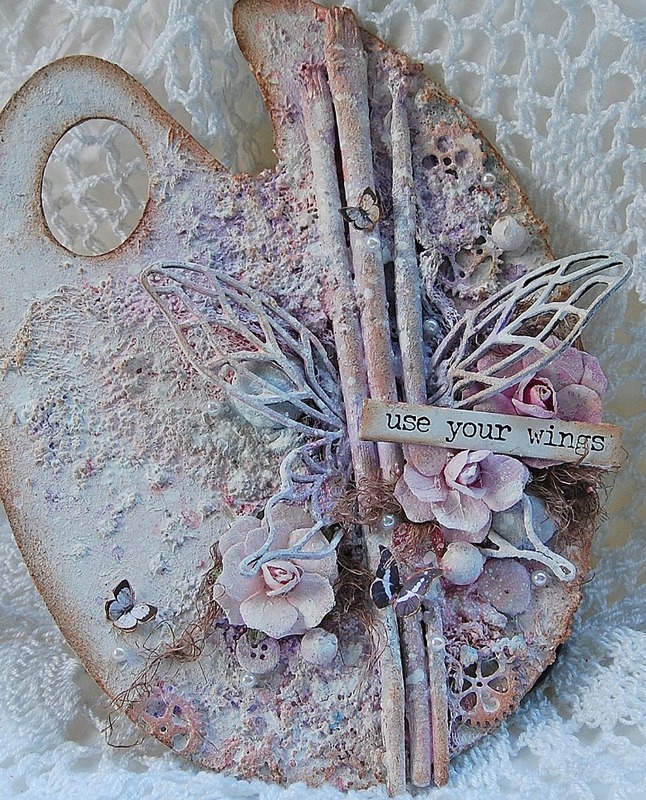 I adhered old brushes with gel medium but I wanted to create the effect that the brushes are flying so I adhered the beautiful Fairy Wing Set 1 of each side of the brushes. I adhered with gel medium on the background some of the Gear Set 2 Large and the Gear 1 1/2 . 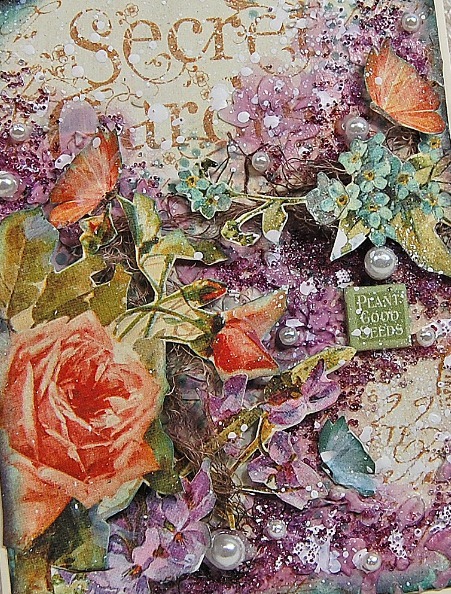 Next, I added flowers, pebbles, pearls and more textures mixing mini art stones with gel medium. I gave color with Color Blooms and metallic paints. You can watch all the creative process in the video tutorial. Thank you so much for stopping by..until next time! Hello my scrapper friends! 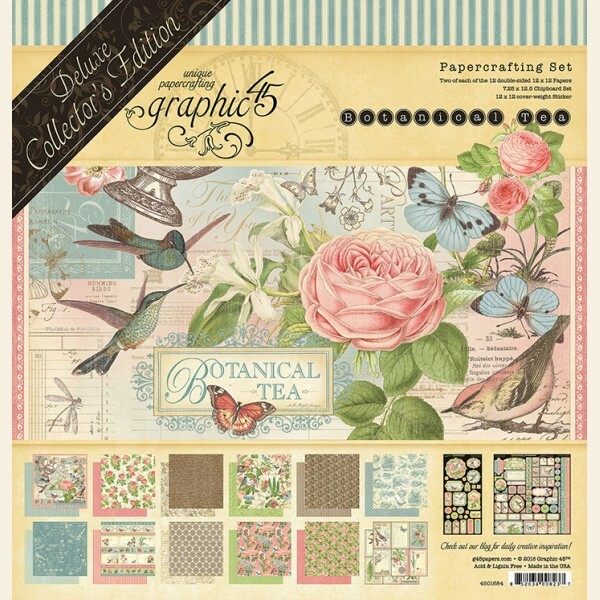 I’m so excited to share with you my first project as Graphic 45 Ambassador. 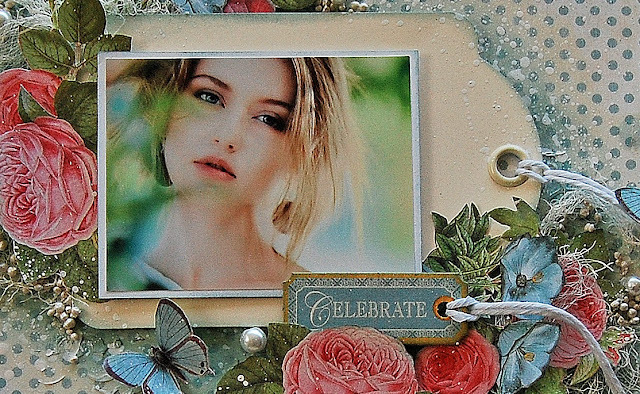 I created a layout using one of my favorites collection Botanical Tea. I started giving textures to the polka dot paper with a stencil and modeling paste. I dab the Antiquing Dye Ink over the acrylic mat and I mixed it with water to paint all the stencil work. I let it dry. 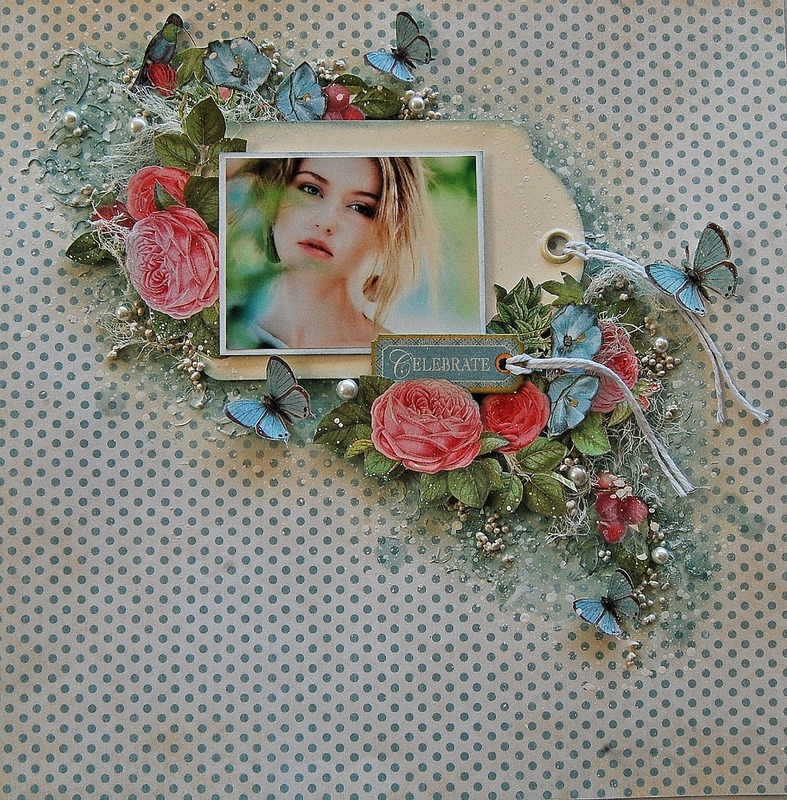 I took one tag from the Regular Ivory Tag Albums to mat the photo. 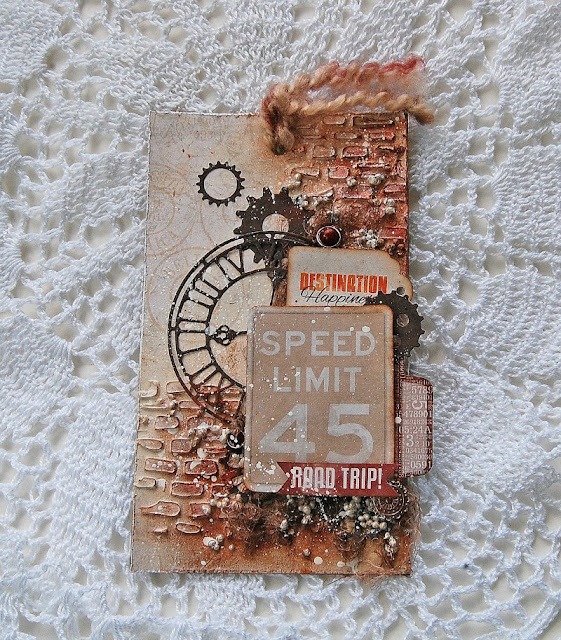 I distressed with the ClearSnap Decades Dye Pad all the edges of the tag and the photo. I cut out the flowers, butterflies, birds and, leaves from the papers. Once I created the design on my page with the different chipboard, stickers and die cuts pieces, I added 3D foam tape on the back of them. It added dimension and highlight these elements. I added some art stones with gel medium to create more textures and for a feminine touch, I added some pearls here and there. You can watch all the creative process in the video tutorial. Thank you so much for your visit today, Until next time! Hugs!! Hi my scrapper friends! 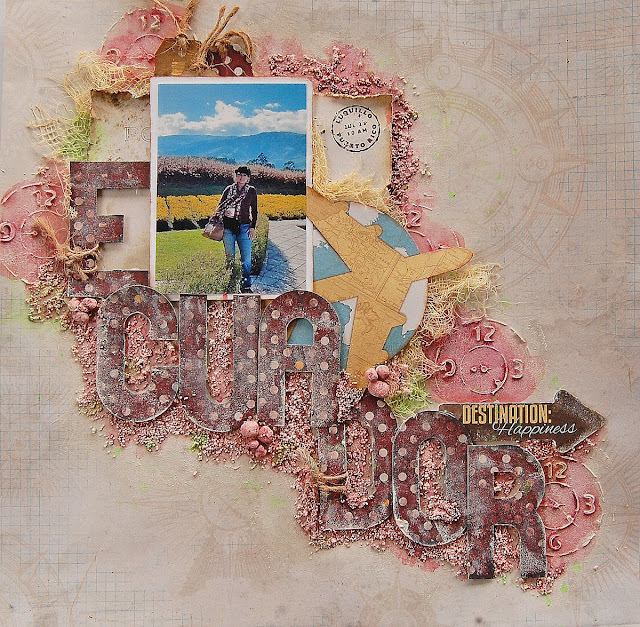 I want to share with you a couple of tags with the video tutorial that I made using the new World Traveler collection by Bo Bunny. I love to travel so I had fun creating with this collection. I tried to highlight the vintage look of this collection using brown, copper inks. But let me start from the beginning, I cut two pieces 3 1/2" x 6 1/2" from two different ivory papers from the collection. I gave textures with the Backsplash stencil and modeling paste. 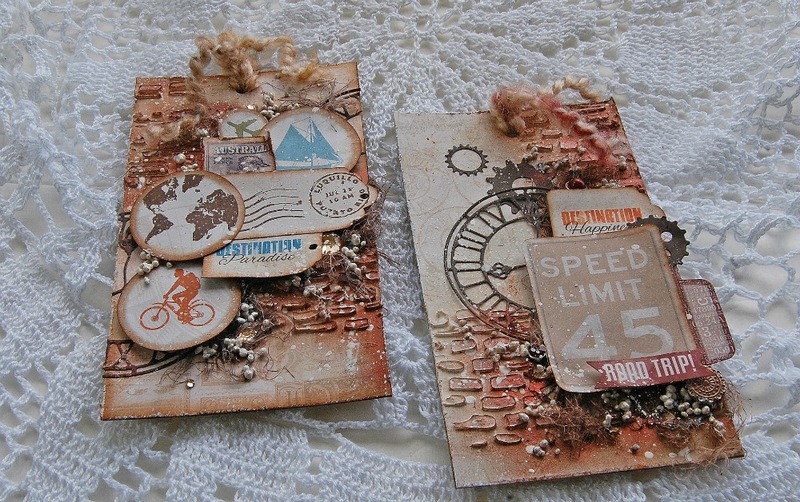 In my first tag, I adhered some clocks and gears that I cut out from the Bo Bunny's craft dies with a brown paper from the collection. To give dimension and interest I adhered some die cut from the Noteworthy package with adhesive foam dots. 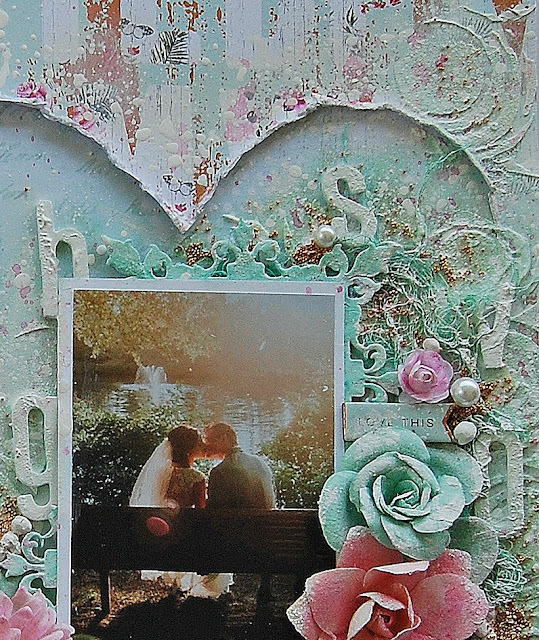 In the second tag, I used the same elements but created a different composition. These are three of the products that I used to create the tags. 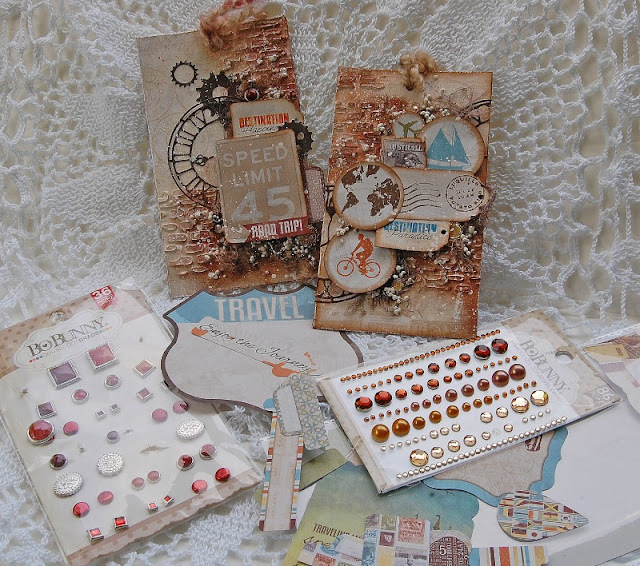 The Noteworthy package with all the fantastic die cuts pieces so easy to work with them, the brads that I added to my first tag to bring the metallic look. 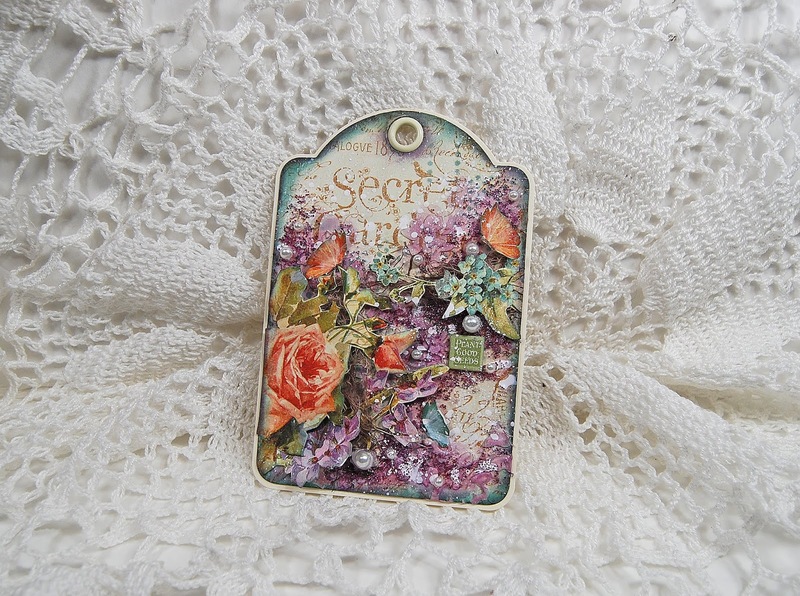 And for my second tag I gave a sparkle look with some jewels. 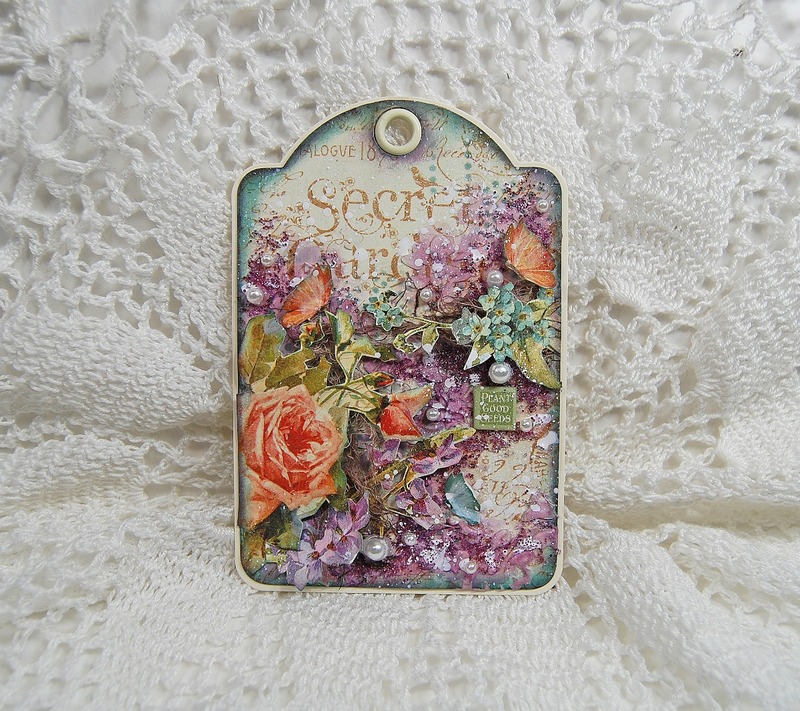 You can see here from this angle the dimension and layers that I created on the tags with the different die cuts and elements. You want to see how I made them, don't miss my video tutorial below! Hi scrapper friends! I want to share with you a project that I created using the new Word Traveler collection by Bo Bunny. 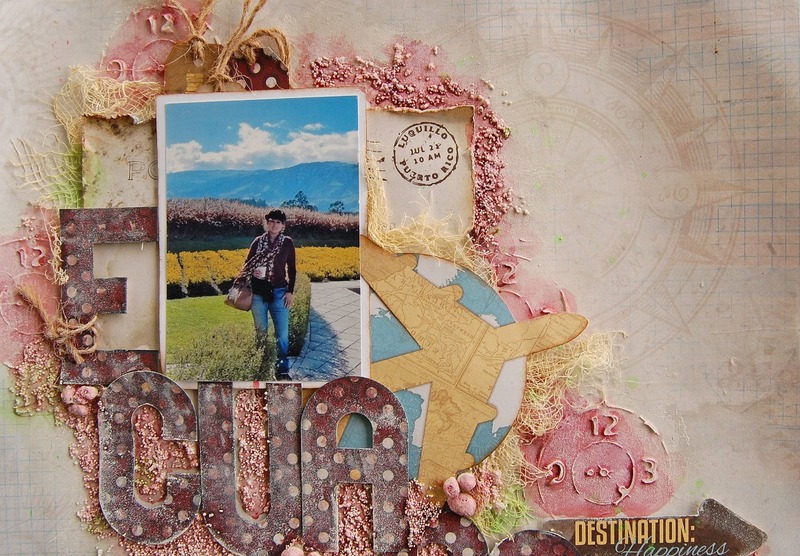 I travel to different countries in order to teach mixed media and scrapbooking classes. 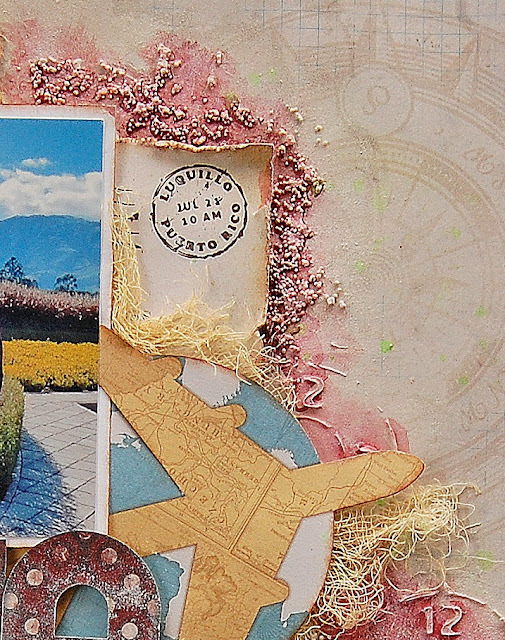 Last month, I went to Ecuador and took this photo with the beautiful mountains on the back. When I saw this collection I knew they were the perfect papers for this picture as the theme and colors match perfectly. 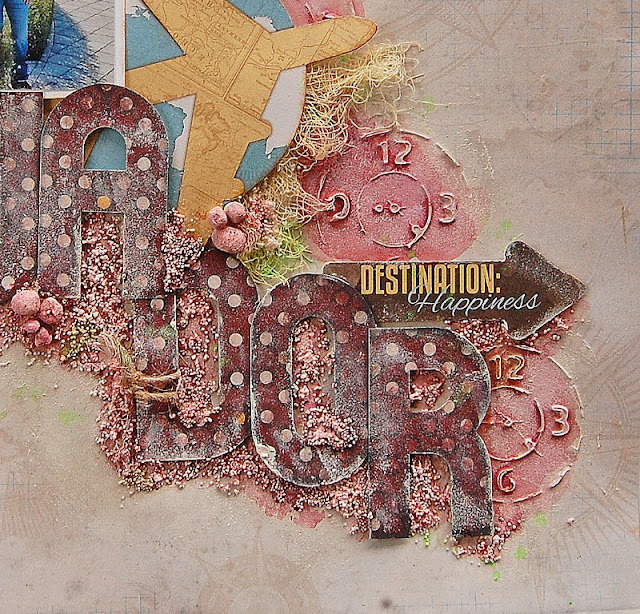 I started by selecting this paper with neutral colors and nautical designs as the background, and added textures using a clock stencil with modeling paste. 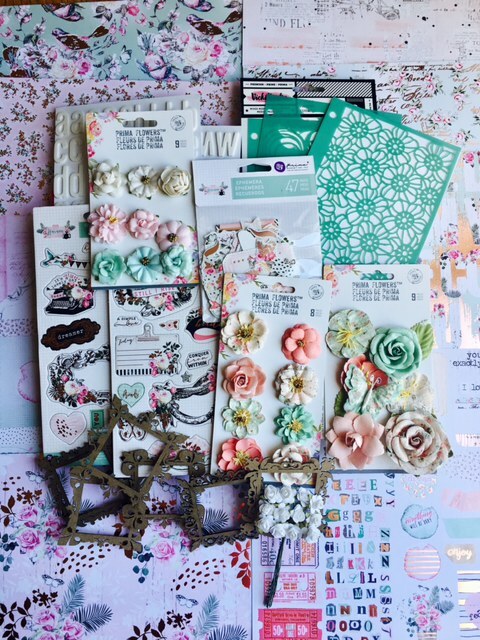 I started to create my design using the die cuts pieces, stickers and letters that I made with the alphabet punch board. 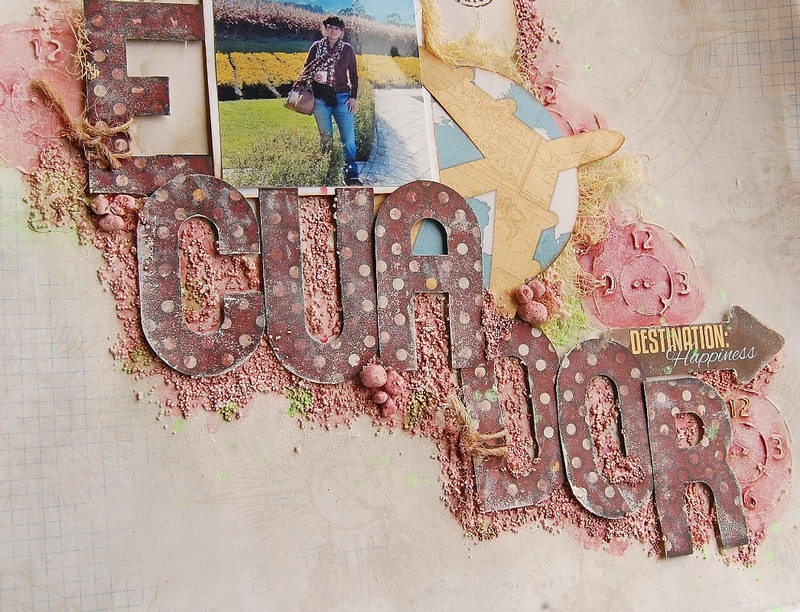 I adhered 3D foam dots behind the die cuts, photo and letters to add dimension and interest in some areas on my page. I added textures with beads around the letters to highlight them and painted their background with a burgundy color. Here are three different products and tools that I used on this project. The Alphabet punch board with witch I made the letters for my title. 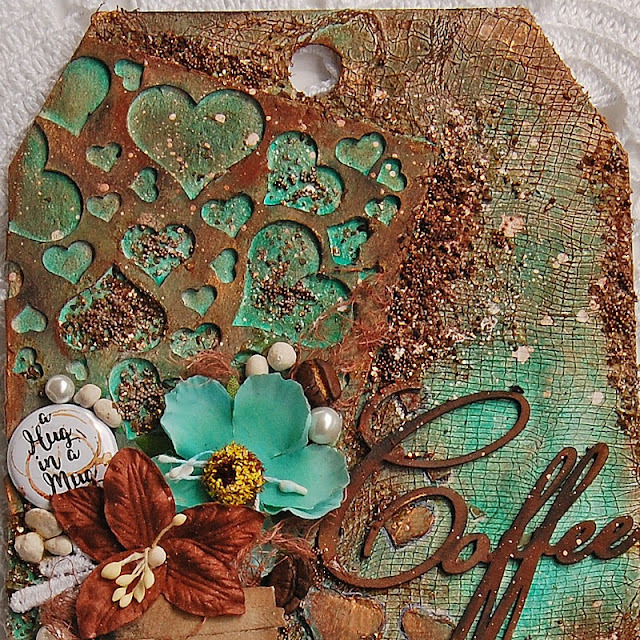 The clock stencil to give that awesome textures on the background and added the green color touches with the mint glimmer spray. Being Puerto Rican, I couldn't resist to cut out the postal card from Luquillo, Puerto Rico from one of the papers and adhered behind my photo. 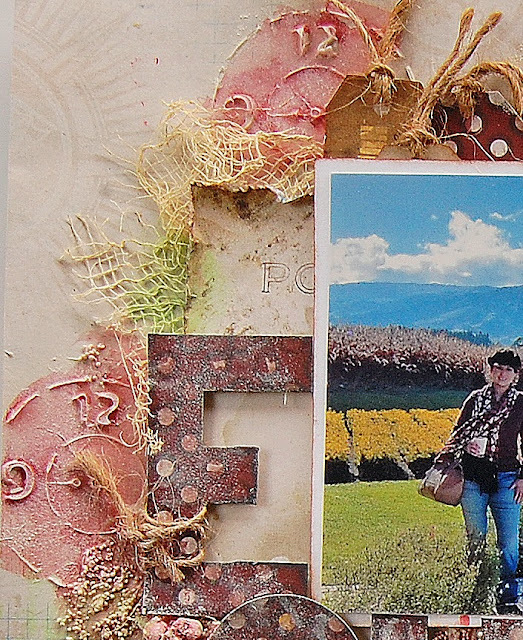 I cut some tags from the papers and adhered them behind the top of the photo. I hope you find some inspiration...until next time! 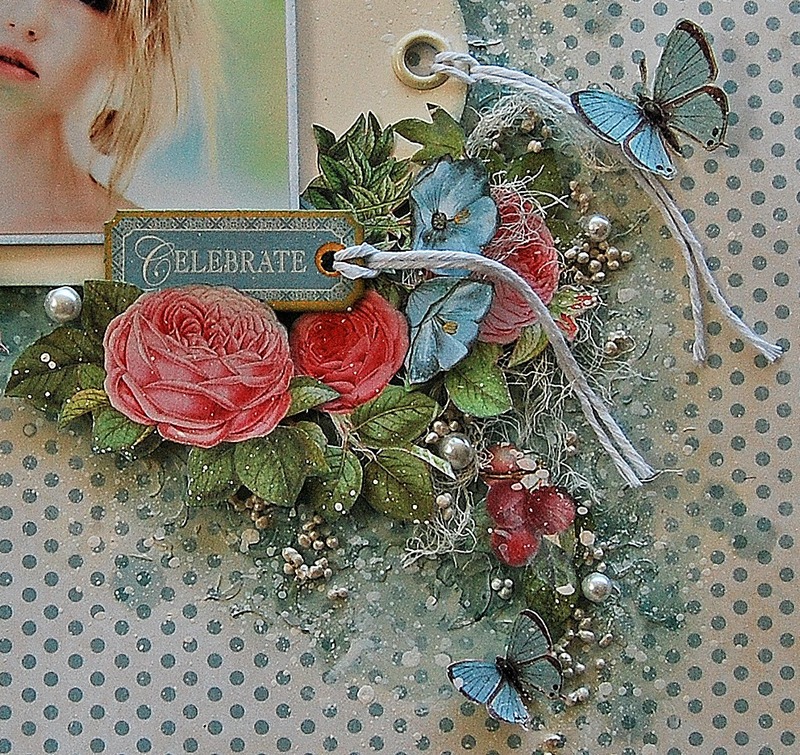 I love this paper I think is my favorite from this collection. My challenge was how to highlight the photo with this busy paper but I think I got it right. 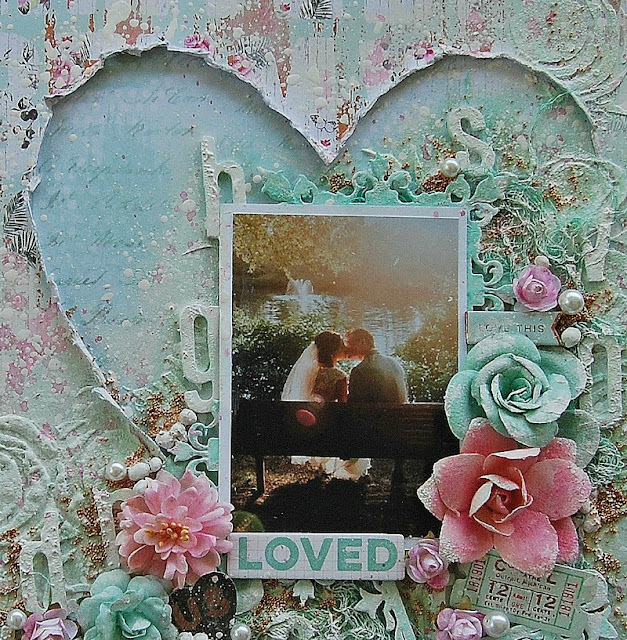 I cut a heart shape on the paper and adhered a piece of green paper from the same collection. You can watch all the creative process in the video on my YouTube channel. I used the chipboard and die cuts from the same collection to decorate around the photo and flowers. 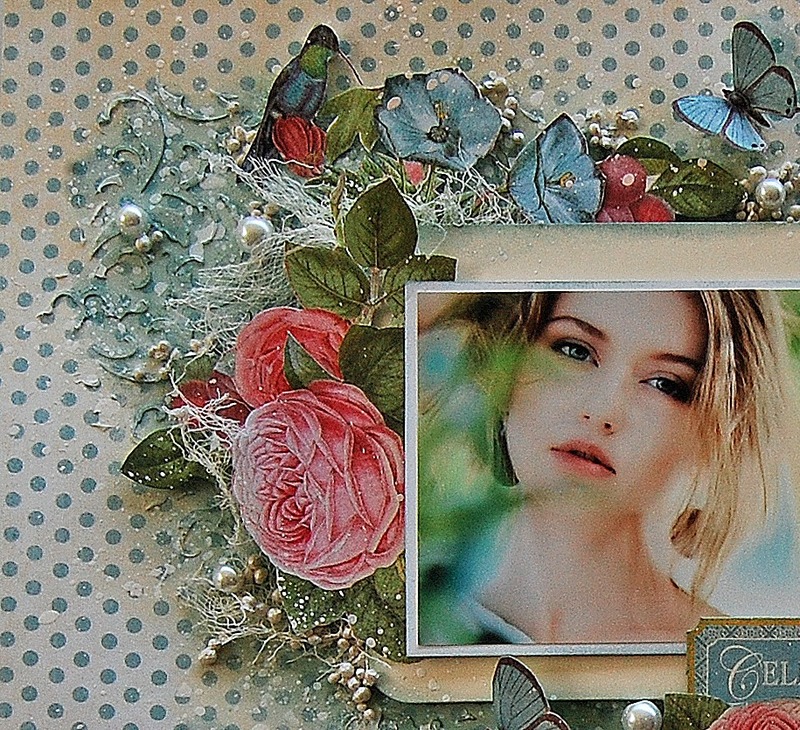 I was inspired on the same paper design to create the background. 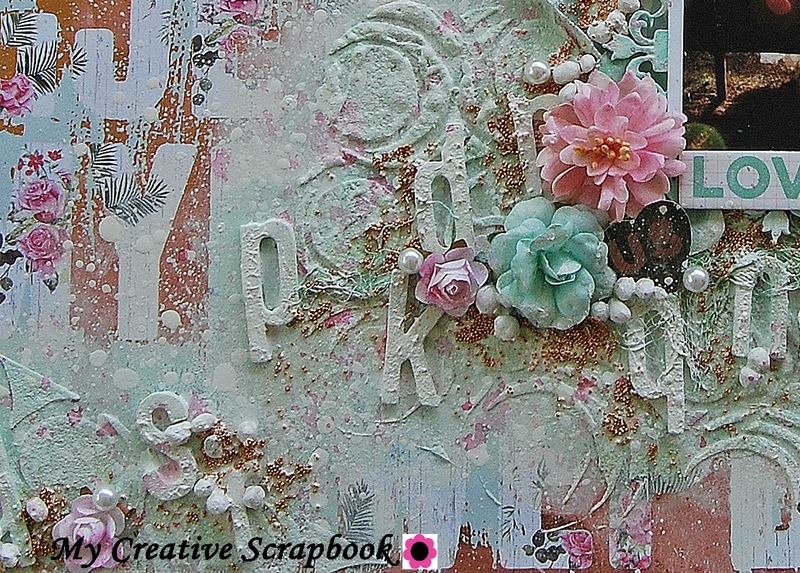 I adhered letters from the ABC here and there, then I gave a coat of gesso over all the textures . 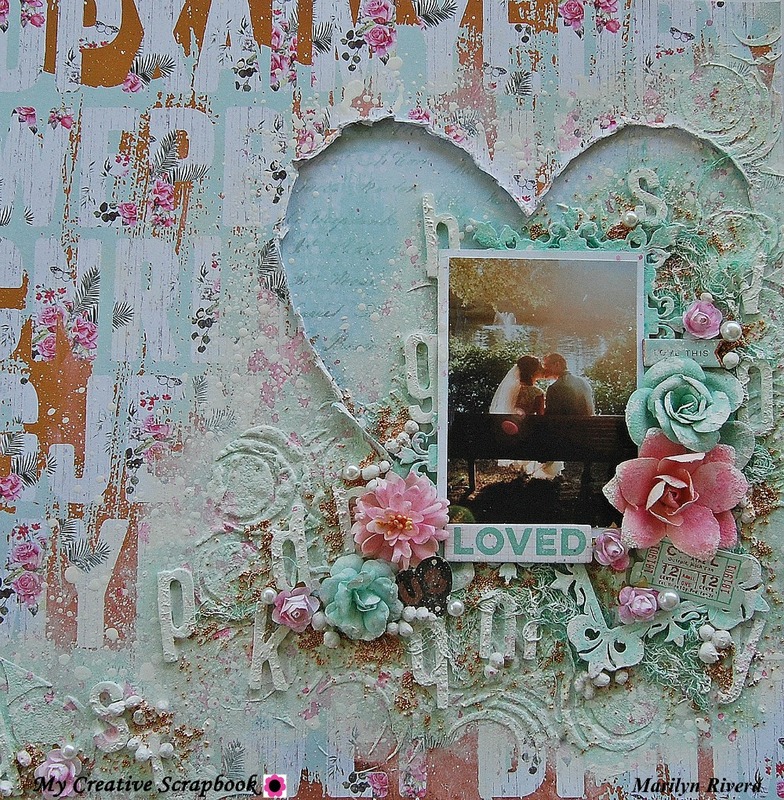 I embossed the frames in mint color. 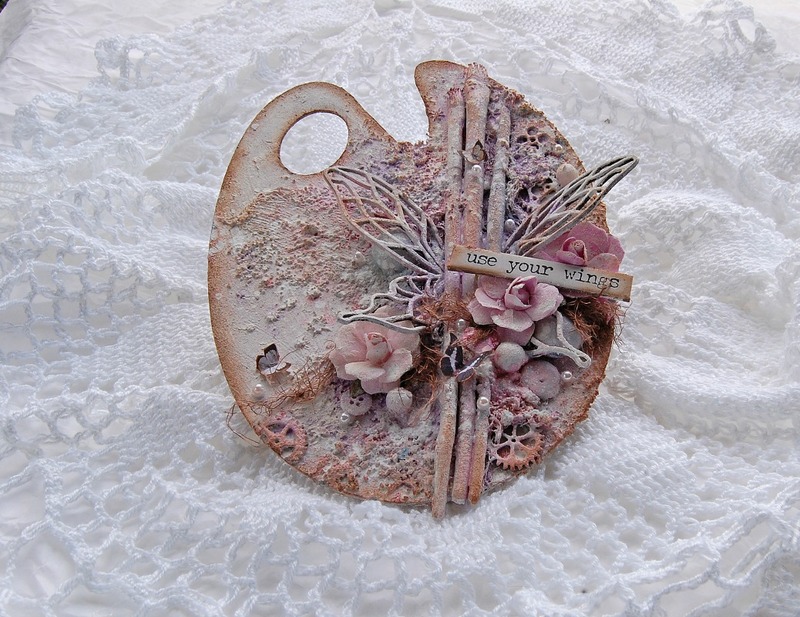 The flowers were peach and white but I took the pink distress ink to paint them. Here's the video tutorial. Enjoy it!! Hello everyone! I love coffee, the aroma the flavor so it was so delicious and fun to create this tag. 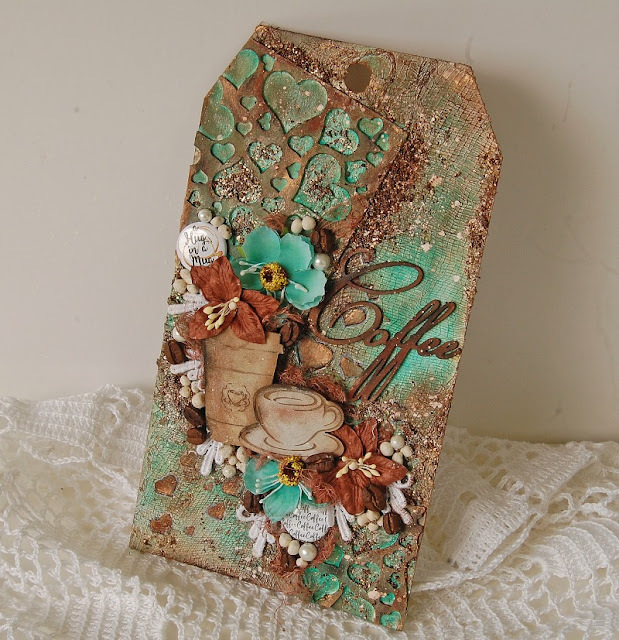 I used mugs, coffee items from the Creative Embellishments shop. 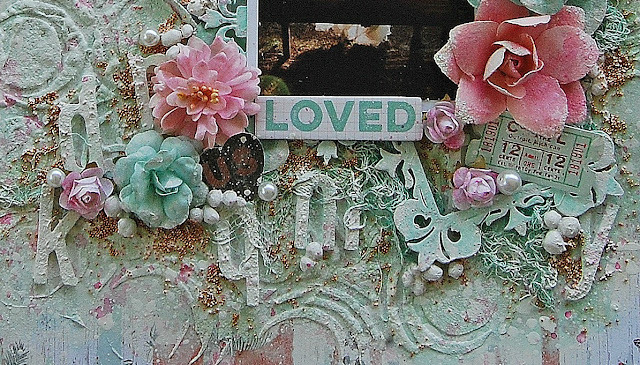 I started cutting two pieces from the Full of Heart Panel and adhering to one of the Large Tags. I covered the tag with cheesecloth then I gave textures with the Heart Bokeh Stencil and modeling paste. 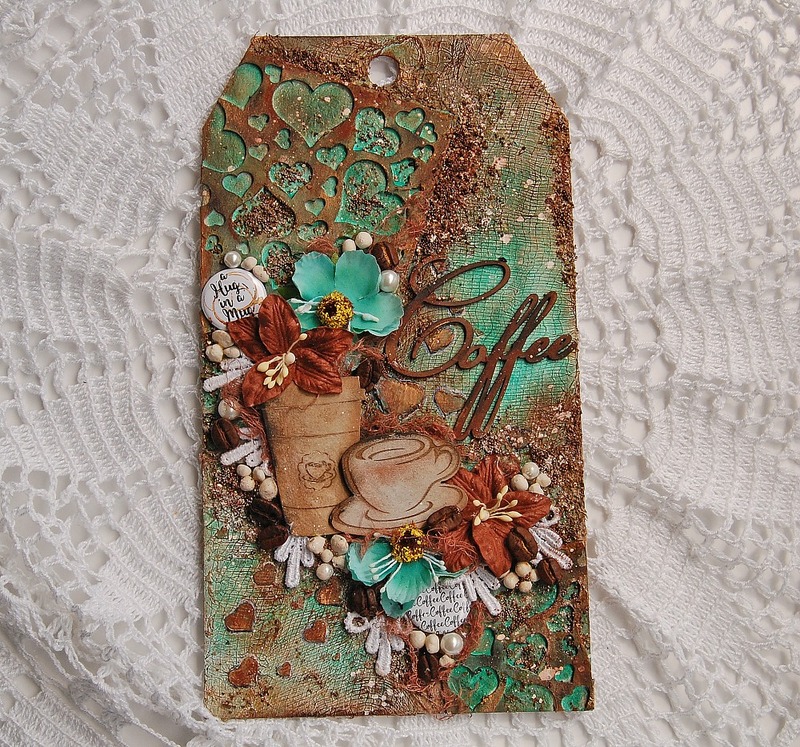 I painted with Distress Oxides the Coffee word and the tag with artisan powder, distress inks and wax. 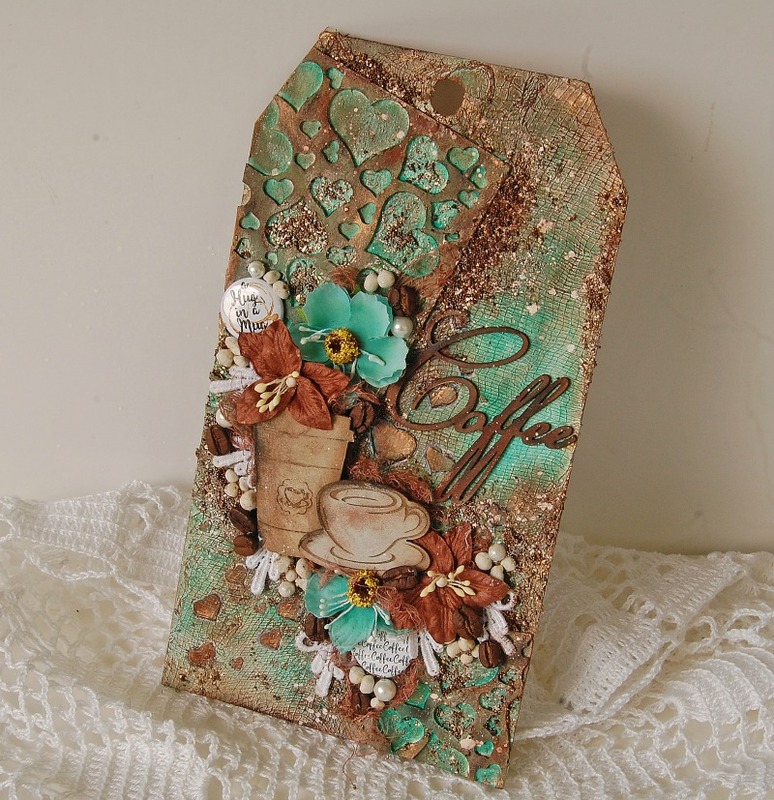 I added different textures with fabric, art stones, micro beads and adhered with gel medium two cute Coffee Flair . 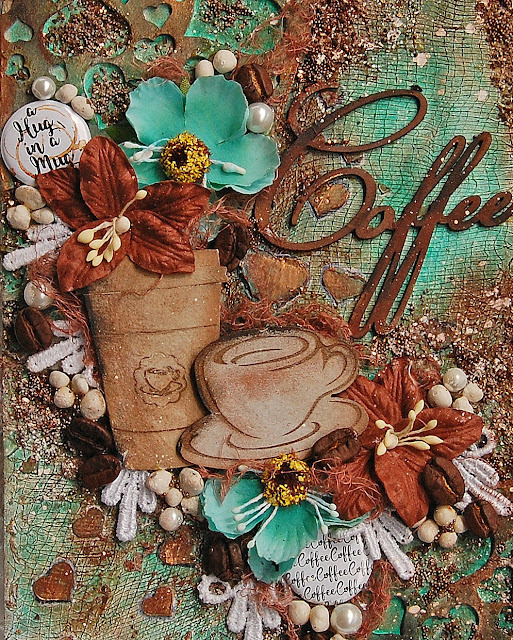 I also adhered some coffee beans that brings a delicious aroma to the project. 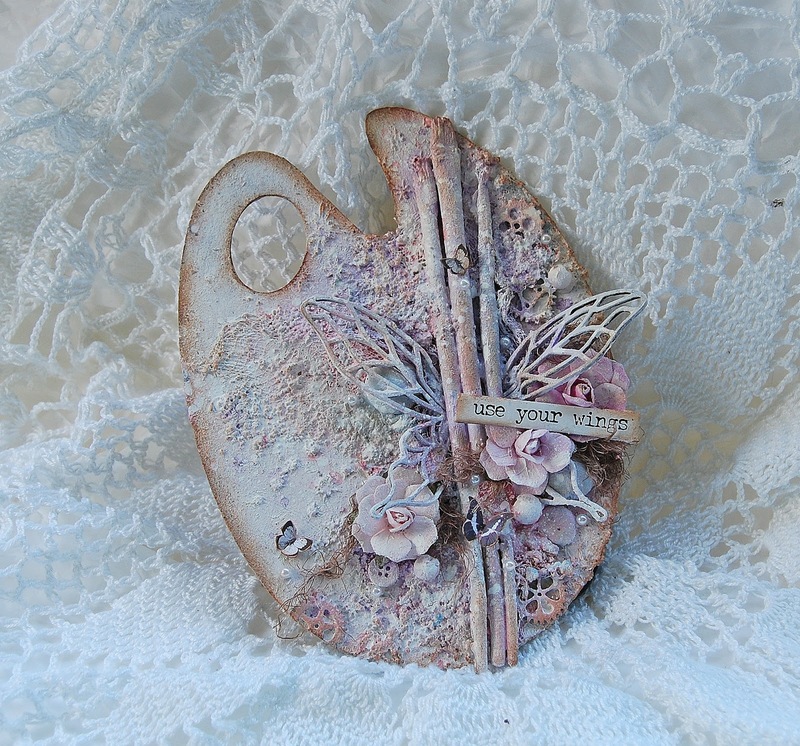 Thank you for visiting the blog today, Have a great day! !